Last night's live performance of The Last Of Us included a little something extra: a never-before-seen ending to the game. This scene, according to Last of Us creative director Neil Druckmann, was intended as a goodbye to Joel and Ellie. Warning: There are spoilers for the main campaign in this article. The bonus scene takes place sometime after the events of the main campaign. Joel (Troy Baker) and Ellie (Ashley Johnson) are now living in Tommy's compound in Wyoming. Ellie's in her bedroom listening to her iPod when Joel enters. "He brings out a guitar and sings a song," said a NeoGAF member who attended the performance. When he's done, Joel gives her the guitar and promises to teach her how to play someday. Joel then shares a joke that he told Esther, a woman he's now dating: "What's the bad thing about eating a clock? It's time consuming." Terrible as that joke is, they both laugh. Joel leaves afterward. The scene closes with Ellie strumming the guitar. Yep, that's the whole scene. There's no big confrontation over Joel's big lie at the end of the campaign. There's no infected attack. It's just two friends hanging out. This could end up being the last time we'll see Joel or Ellie. Druckmann said earlier this year that he's undecided as to whether Last Of Us 2 will star the duo. In fact, he's not sure that the game's going to get a sequel period. He put the chances of Last Of Us 2 happening at 50/50. 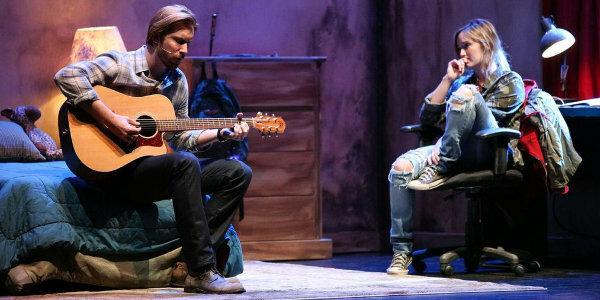 As its name implies, The Last Of Us: One Night Live was a one-time performance. Baker, Johnson and other voice actors did live readings of select scenes from the survival horror game. Gustavo Santaolalla also performed the game's musical score. If you're hoping to find the bonus scene on your new copy of Last Of Us: Remastered, you're going to be disappointed. Druckmann said during the show that the bonus scene will never be released as part of the PS4 remake or the original PS3 version of the game. Furthermore, the live performance wasn't filmed. The above photo might be the closest we'll get to watching this farewell to Joel and Ellie. The Last Of Us Remastered launched on PS4 today in North America. Remastered sports improved visuals that run at 60 frames per second. Director commentary gives players some extra insight into the development during cinematics. All of the DLC released for the PS3 version, such as the Left Behind prequel add-on and multiplayer map packs, are also included.